How difficult it is to learn Spanish? HomeAprender españolHow difficult it is to learn Spanish? August 14, 2014 2 Comments on How difficult it is to learn Spanish? How difficult it is to learn Spanish? How long does it take? Students who decide to learn Spanish language have these questions on their minds. Teachers try to answer, but many times we think it is not enough. In Viva la Lengua we have look for answers. Let’s see what you think about it. How difficult it is to learn Spanish? Not much. Ok, it is very difficult. Well, depends on. Not much. Recently research form Foreign Service Institute of the United States says that difficulty level of learning a language can be classified by number of effective learning hours required for native English speakers. On this ranking, the most difficult languages require 2.200 effective learning hours, such as Japanese, Arabic, Chinese or Korean. On the second place it is possible to find languages that need 1.100 effective learning hours like Russian, Finnish, Croatian, Hungarian, Czech and Turkish. And on the last place are the easiest languages that require around 600 effective learning hours like Danish, Dutch, Swedish, German and Romance languages: French, Portuguese, Italian and Spanish. In conclusion, comparing Spanish and other languages, Spanish language is one of the easiest. Ok, it is very difficult. Doing a comparison between learning Spanish or English, certainly Spanish can be more complicated. Verbs forms, use of the words gender, not use of the pronouns, accents and many other cases are a big headache for all students. What do you think about ser and estar verbs? But, no doubt one of the major difficulty is to understand properly every accent and regionalism of each geographical place. Learning Spanish language in Spain can change depending on the region and if you are in Latin-American countries many words will change. We found a video on Internet from two Colombian boys that talk about this. Well, depends on. Definitely learning a language is not that simple. Time, effort and discipline are required. However we cannot deny that learning a language can be more or less difficult depending on your mother tongue. For a Japanese it is a big challenge to learn Spanish, but for a French, Portuguese or Italian it is easier. So, we can say that learning Spanish can be more or less complicated depends on the distance between your mother tongue and Spanish language. 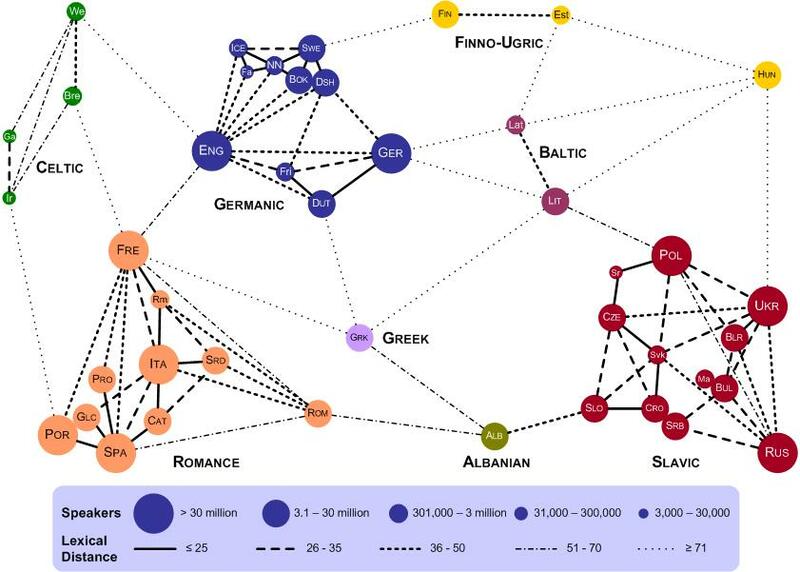 Here you have a graphic about lexical distance among languages. How long does it take to learn Spanish? This is a tricky question and students love to do it. As it is said by Foreign Service Institute, it require 600 effective learning hours. That means if you choose an intensive Spanish course of 20 hours per week, you will take 30 weeks or 7.5 months to learn Spanish operatively (level B2). In case you are 100% concentrated during your lessons. If in addition you are completely immerse on the language, you speak with everyone in Spanish, watch TV, read in Spanish… It does not matter if you are not in a classroom, you are taking learning hours and you will be able to communicate yourself properly and with fluency after 6 months, even when you do not speak as a native person. But you should be careful, many students who take intensive courses think that because they are actually living in Spain, Spanish language comes with the air, and it is not. If all your friends are foreign people like you and do not speak Spanish, you prefer speak English because it is easier to understand and make yourself clear and you are on Internet in your language all day long, you won’t take advantage of your immersion program and definitely you won’t gain hours of effective learning. Another common situation is to take advantage of the mother tongue. French, Portuguese or Italian make big progress on beginner level, but on intermediate and advanced levels problems appear. Overleap languages and mother tongue interference cause common mistakes hard to get out. In conclusion, even when we can talk about number of hours, the final result will depend on the student and his motivation. Me gusto mucho el video!